It’s been 5 years since we visited Eleuthera, so time to head back & walk on their famous pink sand beaches. 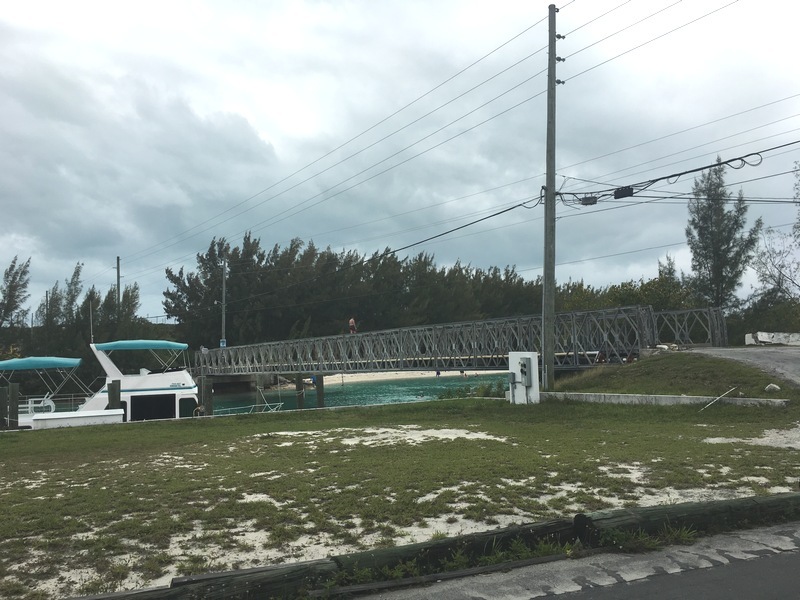 Crossing over from Staniel Cay is an easy 46 miles to Rock Sound near the southern end of Eleuthera. Almost caught a fish on the way – it was so big, that attempting to clutch down the screaming of the line caused my 80 lb. fishing line to snap, fly back & wrap around our solar panels – darn! 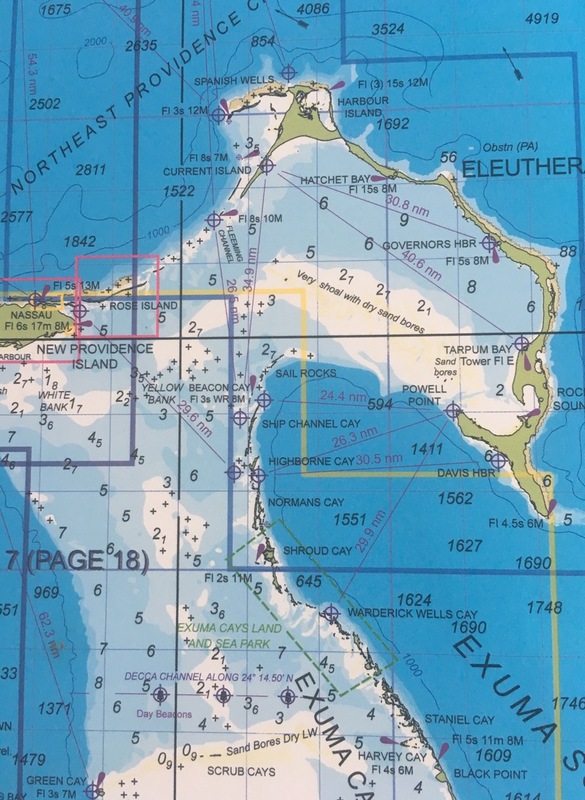 Rock Sound is approximately 1 1/2 miles around, but shallow & protected on 3 sides so you just anchor in the quadrant you need wind protection from. Eleuthera Island was founded in 1648 & is the official birthplace of the Bahamas. Captain William Sayles & a group of Puritans (known as the Eleutherian Adventurers) sailed from Bermuda in search of religious freedom. 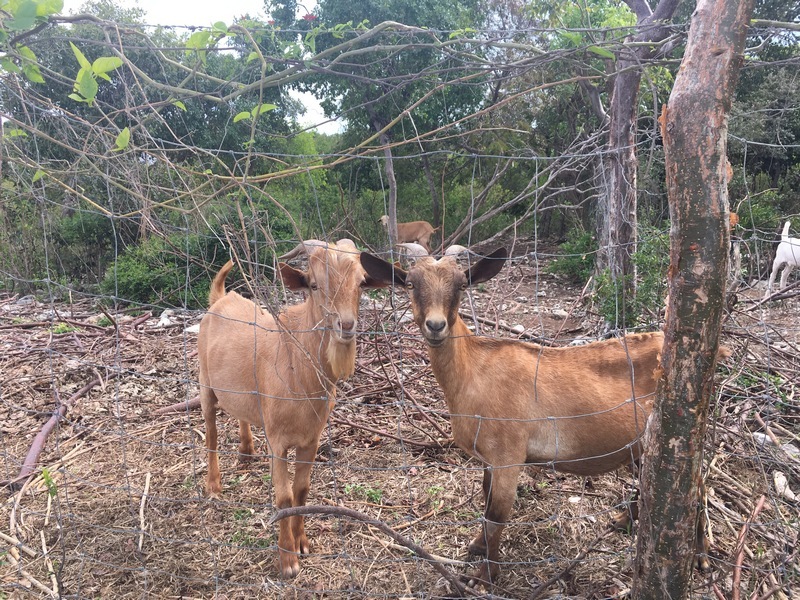 The difficulties of settlement ultimately left only a few of the settlers on the island, thwarting their aim of creating the first democracy in the Western Hemisphere (almost 130 years prior to the American Revolution). Prior to that, Eleuthera had been occupied by the Lucayan Indians. Unfortunately, Christopher Columbus & other Spanish “visitors” caused the deaths of many from disease & those remaining alive were enslaved by the Spanish in the 1500s & shipped to South America to work in the gold & silver mines. This time it was much calmer. By the morning, even calmer – a millpond without even a ripple. Once the winds died down, we bravely continued north to Governors Harbour. I say bravely, as when we stopped there last 5 years ago in Ortolan, the weather forecast had been completely wrong & we ended up anchored stern-to barely off the beach in high winds with large waves until the wind finally shifted to it’s forecasted direction the next day. (actually they had donuts which were good – these danish were excellent!). We remembered from last time this tiny, but good bakery tucked behind a row of houses. We had planned on having lunch from a “take-away” restaurant, but it was closed. 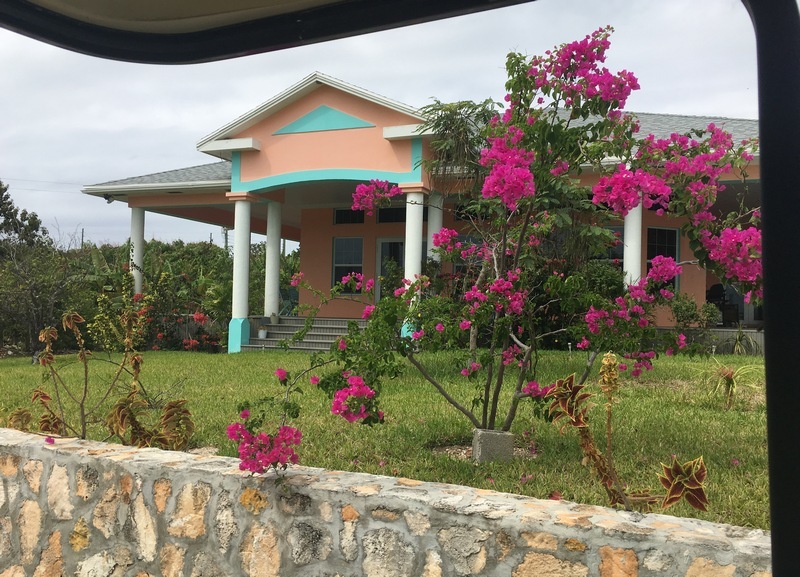 We exchanged some books at their library – probably the nicest we have seen in the Bahamas. This was a one-season reality TV show featuring the Spanish Wells lobstermen. If you Google around, you may be able to view an episode or two. Our 3rd stop was Spanish Wells. A busy & industrious little town. In addition to boat repair yards, they are most well known for their lobstering industry. 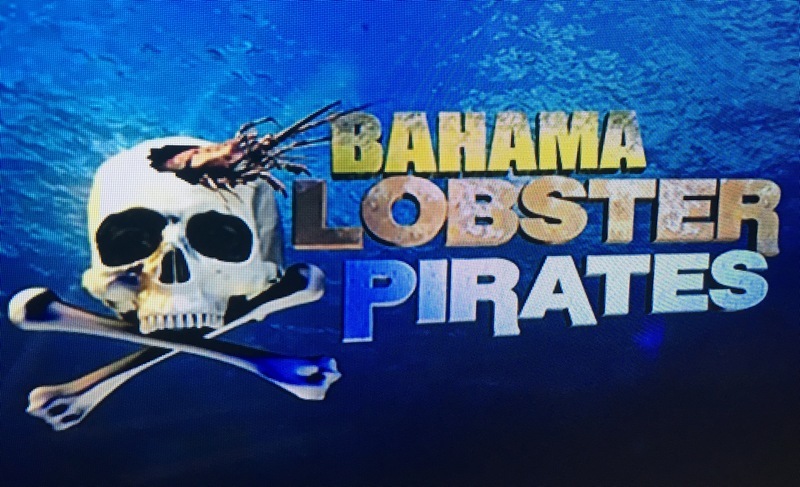 During the 8-month lobstering season, their fleet of 10+ large fishing boats, each towing several smaller fishing boats, travel 150 – 200 miles south to the far southern Bahamas where they don’t spear or trap the lobsters – they “accommodate” them with “lobster condos”. They place thousands of these large, flat structures which the lobsters seek shelter under. Divers come along, tip up the structures, grab & harvest the dozens of surprised lobsters. Spanish Wells provides all of the lobster tails served at all of the Red Lobster restaurants in the U.S. The Spanish Wells lobstermen are indeed extremely industrious. They have formed cooperatives for their power, water & most importantly their large fishing fleet. To remain focused on work, up until a few years ago, the island was dry – no alcohol – now that’s serious. We treated ourselves to an actual dock at an actual marina – the first one in months! Our friends Glenn & Linda on Mintaka just happened to be there – Just how it is in the cruising world! 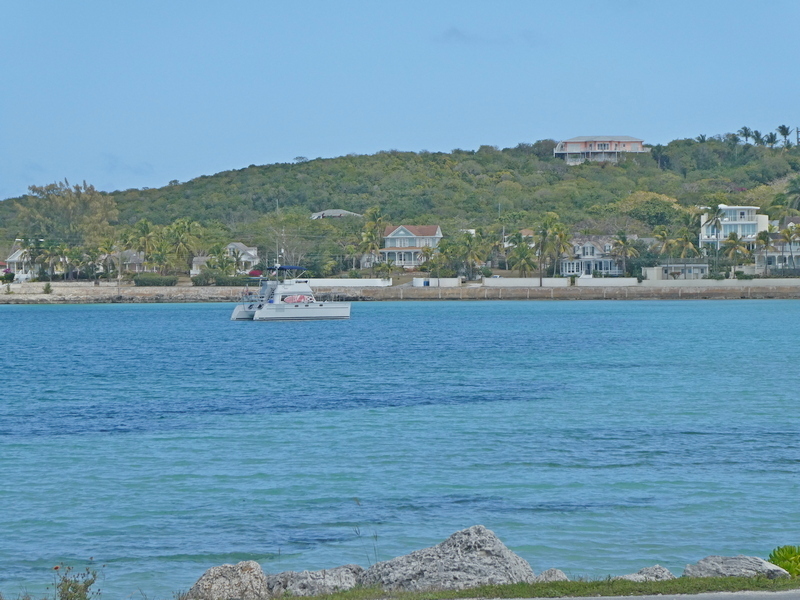 Looking out over the “cheap seats” – the moorings we stayed at 5 years ago. Sorry Benj, we’ve decided to just go ahead & spend your inheritance! Going all out, we even rented a golf cart to tour around in. 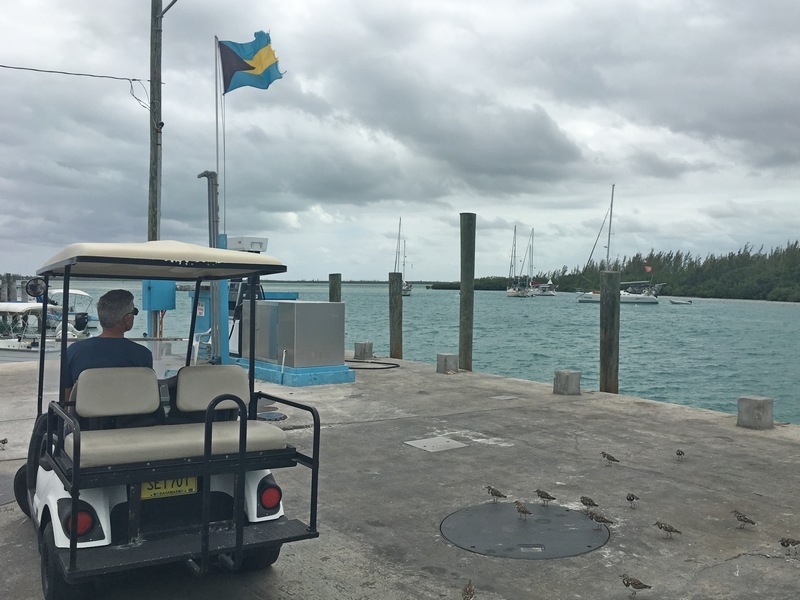 With the weather looking calm for a few days, we’re heading off to anchor at nearby Royal Island to head north to the Abacos for our last few weeks in the Bahamas. I just saw what I think is a Fountaine Pajot Summerland 40 next to you in that marina pic. Is that your friends? I’ve been looking at those along with the PDQ’s. Yes, that’s them. 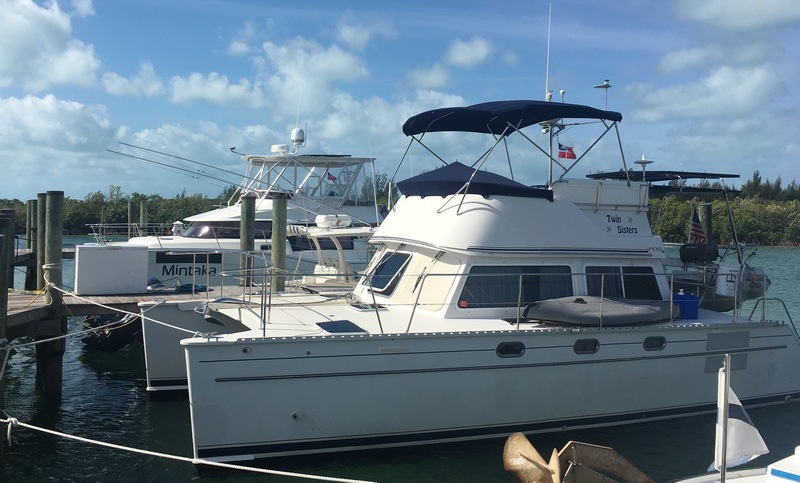 A good sized boat, not overdone and a spacious enclosed flybridge. I really like them. You guys are like lightning striking twice for me. Both of my current favorite prospect boats next to each other at the same time. I’m heading to Beaufort, NC tomorrow to splash my boat for the season. If you guys make a stop there this year on your way north maybe I’ll see you there? We aim to please! Must be Spring if you are splashing 🙂 We like to stop in Beaufort and you may see us there- we can talk boats! Thanks for sharing the journey. I’ve enjoyed reading the last several post. Safe travels! Nice to have you along! We’ve made this trip up and down more times than we ever thought!